Madagascar iguanids present a bit of a conundrum. There have been no fossil remains of iguanids found in Africa, Asia or Australia, just Central and South America. How, then, did lizards meeting the taxonomic criteria of iguanids turn up alive and well in Fiji (Brachylophus) and Madagascar (Oplurus, Chalarodon)? In the recent past, rafts of storm-drivien debris has been documented as carrying green iguanas to distant islands in the Caribbean. This was the first real proof scientists had of theories of how flightless animals made it from where they originated to distant places. A vivid example is the evolution of the Galápagos iguanas, Amblyrhynchus and Conolophus, over the course of ten million years, from the ancestral green iguanas who rafted over from the west coast of what is probably modern day Ecuador. A parched voyage of some 600 miles is amazing enough, but certainly possible. How to explain the far greater voyage, though, of either iguanas or iguana eggs, from either the main coast of north-central South America or the Galápagos to Fiji, a journey of some 7200 miles across the open sea. That journey pales by comparison to trying to figure out how iguanids got to Madagascar! There are two other theories that gets these small, swift-like iguanids to Madagascar without having to cling to a piece of flotsam or wait for the next intrepid explorer going their way. Both theories center around the break up of Gondwanaland. One holds that the modern day Malagasy Iguania are descended from Preiguania that were already extant on that land that eventually became Madagascar. Fossil remains of a turtle and a boa, both New World reptiles, have been found in Northern Africa, so it is possible that fossil iguanids have not been found yet. Perhaps there were Iguania or Preiguania in what became Africa but, not being as successful as the agamids, failed to survive other than on insular Madagascar. Just when Gondwanaland broke up, how fast it moved, and just where Madagascar started out and what other large land masses it might have come into contact with as it drifted to its present position off the southeast coast of Africa, remains under discussion by paleobiologists and others. 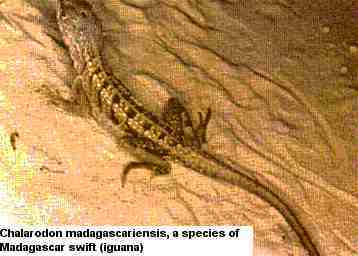 In any event, there are two types of iguanids in Madagascar, the Chalarodon, that looks rather like a swift, and the Oplurus, looking rather like a swift with a particularly spiky tail. There is only one species in the Chalarodon genus. These lizards may reach 25 cm (7.5 in) in overall length. Native to the steppes area, these diurnal, terrestrial lizards feed on arthropods. Unlike the Oplurus, they have a dorsal crest. With the exception of the O. cyclurus, the Oplurus species are terrestrial lizards, residing primarily in the drier treed steppes and open forested areas. Their tails are encircled with enlarged, spinous scales. Unlike the Chalarodon and many other iguanid lizards, they have no dorsal crests. To 25 cm (7.5 in.). O. cuvieri. About 25 cm (7.5 in.). Brown with several dark crossbands and light spots, especially distinct on back. Lives in rocky areas. Terrestrial. O. cyclurus. About 15 cm, 7 cm SVL (6 in. STL, 2 in. SVL). White-bordered black neckband. Lives in treed steppes and open forests. Arboreal. There isn't a great deal of information for the captive care of Chalarodon or Oplurus, or similar lizards such as the five-lined skinks (Eumeces spp. ), Lacertas (Lacerta spp. ), or keeled skinks and lava lizards (Tropidurus spp.). See the captive care article for the South American Swifts (Liolaemus) for more information. Spacious, dry terrariums with sandy soil; keep one area slightly damp. Rocks and bark slabs for hiding; branches for climbing. Plants such as bromiliads, ivy, pothos, etc. are suitable and will help retain moisture in one area. For Oplurus cyclurus: provide an arboreal environment, more as for open forest rather than rocky steppe. Daytime temps from 25-30 C (77-86 F), with a warmer basking area. Temps at night down 10-15 degrees. UVB lighting required. 10-12 hours on, 12-14 hours off. Carnivores, eating primarily insects; larger specimens may take mouse pinks. Gut-load prey before feeding. Vitamin and calcium supplementation required. Oplurus, and possibly Chalarodon, drink by immersing their mouth in water and using their tongue to lap it up. Water should be provided in a shallow bowl (so that it is easy for the lizard to get its head into the water. The plants in the Chalarodon should be sprayed with water to help boost the humidity. F. Obst, et al. The Completely Illustrated Atlas of Reptiles and Amphibians for the Terrarium. 1988, TFH Publishers, NJ.